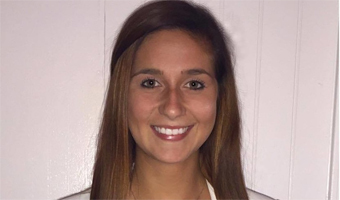 After changing her major from biology to Sociology-Criminology, Alysha Funk decided to start preparing for law school and found an internship that would help her resume stand out from the rest. Funk found her internship through a friend, who connected her with the Law Director for the city for Athens, OH. She interviewed at the prosecutor’s office and was offered a position there on the spot. “I actually had to change my resume a lot,” she says. “I included relevant classes…. Last semester for my research class I did a study of sexual assault on campus, so I included that. I also had to include references, but I included more academic references than job references.” For help creating her resume, she went to the Center for Law, Justice, and Culture and was assisted by Pre-Law Adviser Larry Hayman. Before writing a discovery, Funk gets a copy of the ticket, the incident report, the victim, any witnesses, a police report, and sometimes security footage. “It’s like putting everything in one place,” she says. At the end of the discovery she lists everyone who could be called for trial and any previous charges the defendant has that are related to the case. Funk’s responsibilities don’t end there. She runs occasional errands and shuffles some paperwork, but not without getting involved in what goes on in the courtroom. Funk works in the municipal court, so she only tends to handle misdemeanors. This kind of exposure is valuable, because not everyone in Funk’s position has gotten this sort of hands-on education. “My boss told me when she graduated law school she had never actually seen a jury trial, so for me to have already seen that is a pretty big deal. It’s a lot of good information to already know,” she says. 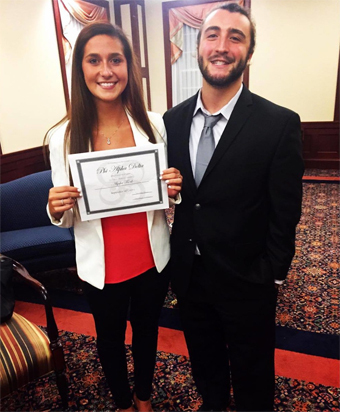 Funk, pictured with Dan Shisler, was a member of the law fraternity Phi Alpha Delta during her time at OHIO. Funk graduated in December and plans to take a year off from school to study for the LSAT. She’s also been offered a paid internship at the prosecutor’s office, where she will be doing a lot of the same tasks, but taking on more hours. On top of this, she’ll still be working her other job in Columbus. She is confident that this internship experience, while not actually done for credit, will serve her well. Not only is she getting relevant work experience, but she’s making great networking connections. Funk expressed that she initially intended to do her internship for credit, but quickly realized that working for the credit is a big time commitment. She emphasized that it is beneficial to go out and find these opportunities on your own, either through the school or not. Enjoyed the Alysha Funk article. Alysha (and Dan Shisler pictured with her) were two of my students this past fall in my history class. Both were excellent and will do well in law school. Once again Larry Hayman (and Haley Duschinski) of the Law Center provided excellent service and assistance to our students. Awesome job Lysha. Very proud of you. Keep up the great work.